CMS has successfully detected cosmic rays for the first time in a complete sector of muon chambers. These events mark a major milestone in commissioning the CMS Barrel detector. The CMS barrel seen from its +Z end in the SX5 building at Cessy, where two out of five wheels of the barrel are already equipped with muon chambers. 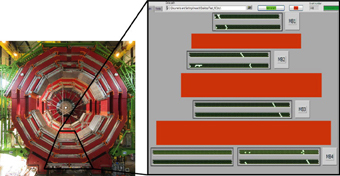 On the right, a snapshot of the online display showing a cosmic muon (white points) through the complete sector. One of the key elements for the Compact Muon Solenoid (CMS) experiment is the precise detection of muons, as the acronym indicates. Muons are expected to give a clear signature for various physics discoveries, including the Higgs boson. A total of 1400 muon chambers of several types will be used by CMS, including the Drift Tube Chambers (DTCs) for the barrel. Since the summer of 2004, the team building the DTCs (including institutes in Aachen, Bologna, Madrid, Padova, and Torino) has been engaged in the delicate and complex operation of installing the chambers in the CMS iron yoke. The DTCs have 12 layers of drift tubes arranged in three groups of four, the one in the middle measuring the coordinate z along the beam direction, and the other two measuring the orthogonal coordinate, known as R-φ. Each layer has up to 60 tubes. Together this information reveals the trajectories of the muons. The image shows muon signals in the R-φ groups in four chambers. Unlike conventional Drift Tube systems, consecutive layers are staggered by a half tube width enabling the DTCs to generate trigger signals for CMS (using a 'mean timer' method). Chambers from the construction sites are sent to a hall in the former ISR tunnel at CERN, where they are carefully assembled with on-chamber cables and pipes and equipped with the 'Minicrates' containing the readout electronics for the chamber. These 'dressed' chambers require very few external components in order for them to become operational and undergo thorough pre-installation tests. Not one but two of the greatest bands in Irish music today take the stage to create a night of Celtic music not to be missed. Join us on Saturday, March 18, as both Lunasa & The Karan Casey Band perform in Fermilab�s Ramsey Auditorium. Tickets are $26 ($13 for ages 18 and under). For further information or telephone reservations, call 630/840-ARTS (2787) weekdays between 9 a.m. and 4 p.m.
A new law for gravity, developed by Dr. Hong Sheng Zhao and his Belgian collaborator Dr. Benoit Famaey of the Free University of Brussels (ULB), aims to prove whether Einstein's theory was in fact correct and whether the astronomical mystery of Dark Matter actually exists. Their research was published on February 10th in the Astrophysical Journal Letters. Their formula suggests that gravity drops less sharply with distance as in Einstein, and changes subtly from solar systems to galaxies and to the universe. hardware failures in the Tevatron interrupted what otherwise has been a fabulous running period. The repairs together with the end effects of warming and cooling sections of the Tevatron have cost us more than six weeks of running. But we have now made lemonade out of the lemons. Even before the down time occurred, the Accelerator Division antiproton stacking team had planned to carry out studies to understand the limitations in antiproton production and accumulation. We had reached a point in the development of the Tevatron where antiproton production was the limitation in producing data.. When the Tevatron went down, the debuncher and accumulator rings that we use to accumulate antiprotons became available for study on a full time basis and the team was ready to take advantage of the situation. The parameter that describes our antiproton manufacturing capacity is the "zero stack stacking rate," a number that describes how quickly the current of antiprotons builds up when the accumulated current or "stack" is very small. We carried out a complex series of studies during the down time that led to improvements in alignments and apertures and a whopping increase in the zero-stack stacking rate, from about 16 mA/hr early in the fall to about 21 mA/hr at present. Now we reach a stored current of 60 mA for transfer to the recycler in three hours instead of nearly four hours. So when you go home, you can uncork the champagne and celebrate this new record and explain to your family that you are celebrating the new record in the "zero-stack stacking rate." I'll bet you they will be impressed! - Three stores provided 59 hours and 59 minutes of luminosity. - Preaccelerator switched to H-. - Recycler losses part of stash. Particles are very, very small--so how can we "see" them? A presentation for non-physicists at noon today, Feb 14, in 1 West with speaker Mike Albrow of Fermilab. The Graduate Student Association of Fermilab, along with the User's executive comittee, for the first time is soliciting nomiations for graduate students to present their work at the upcoming 2006 Users' meeting. Fermilab's Graduate Student Association will hold a Town Hall Meeting for graduate students and postdocs on Wednesday, February 15 at 6:00 p.m. The meeting, held in 1 West, allows grad students to get aquainted with the new Deputy Director, Young Kee Kim, and GSA Reps. The meeting will include Q&A with Young Kee Kim and your GSA Rep's and Announcements for Future GSA sponsored activities. The GSA will have a short presentation (15 min.) about future activities followed by time for Q&A as well. So start thinking up questions now!